Let’s be honest. Walt Disney Picture’s and Pixar’s Cars 2 was a disappoint. Cars 2 strayed far from what made the original Cars movie great. Thankfully, Cars 3 veers back on track. Cars 3 tells the story of Lightning McQueen and his new competitor Jackson Storm (which is a great name. My nephew’s name is Jackson.). Jackson Storm is a rookie race car blazing the course. He’s leaving the old competitors in the dust. That means Lightning McQueen isn’t the fastest anymore. Cars 3 is an entertaining tale. The movie brings back the feel of the original and sets us up for a continuation of the story. And, as usual, I’m here to bring you leadership lessons from Cars 3. Be ready, there’s plenty. Caution: Cars 3 spoilers below. Did I used to say that? Lightning McQueen, voiced by Owen Wilson, is going through his pre-race mantra. Flashing back, he remembers an arrogant mantra he used to quote to himself. He then wonders if he really said something that bad. As a leader, you’re going to say stupid things once in awhile. You’re going to wonder how in the world you could have said something so incoherent, damaging, or silly. Don’t be ashamed of what you’ve done in the past. Your past is done and over with. You can only move forward. Move forward with confidence and do the best you can today. In another Lightning McQueen flashback, we see a scene from the first Cars movie. Doc Hudson, voiced by Paul Newman, is there. He’s mentoring the young Lightning McQueen. Boy, did Lightning ever need mentoring. He was narcissistic and brash. He thought he was the best. Doc Hudson helped Lightning realize he needed help. He wasn’t the best. But he could get better. You may be a lot like the young Lightning McQueen. You might be brash or arrogant or think you know everything there is to know about leadership. I’ll be frank with you: You’re wrong if you believe you know everything you need to know. Finding a mentor will open your eyes to the areas your missing it. Don’t be afraid to find someone to help you grow. You’ve got plenty of room to do so. I can’t tell if they have more fun on or off the track. Lightning McQueen, Bobby Swift, and Cal Weathers head towards the pits together. These three racers have had a friendly rivalry for years. We were treated to scenes of playful banter and joking. We could tell these three racers were friends and they were cool with one another. Not only that, we could see these racers had fun. Sure, they were competitors but they also saw the benefit in their friendship. They were able to have a good time on the track while challenging each other. Where ever you go, you’re going to have competitors. How you treat those competitors will vary but I’d like to encourage you to be like Lightning McQueen, Bobby Swift, and Cal Weathers. Find common ground. Create a friendship. Don’t let business get in the way of having fun. By creating friendships with competitors you’re going to be able to refer business to one another without fearing a loss of a customer. Jackson Storm won his first race against Lightning McQueen. His win was unexpected and he came out of nowhere to win. No one was expecting Jackson Storm to win. He was an unknown. Yet his presence became known rather quickly. Race announcers soon knew his name. Fans began chanting his name. Non-fans began to take notice. I don’t want to alarm you but there are new leaders popping up everywhere. Some of the new leaders are going to surprise you. Don’t let that scare you. Welcome these new leaders into the fold. You have an opportunity here if you take advantage of it. Lightning McQueen had mellowed in his later years. He wasn’t as flashy or prideful but he still had a burning desire to win. This desire made Lightning push the boundaries of his car. As he was trying to catch up to his antagonist, he pushed himself too hard. He hit the wall, blew his tires out, and did not finish the race. His desire to keep pushing sidelined him. There’s a lot of talk in the leadership and personal growth arena about hustling. You have to be on ALL OF THE TIME. You have to keep pushing yourself. While I agree there’s a time to push, you also need to realize there’s a time to let off of the gas. To be aware of your limits. If you don’t, you’re going to burnout as a leader. There was a lot left in me. I never go to show them. If you remember back to the first Cars movie, you’ll remember Doc Hudson had a serious wreck. He never returned to the racing world. Doc laments this in a flashback scene. He knew that while he was old, he still had a lot to offer. Remember this as you grow in leadership: No matter your age, you have something of value to offer. You have skills and abilities others have not seen yet. Be willing to share them. Don’t fear failure. Be afraid of not having the chance; you have the chance! What a great quote from Lightning’s girlfriend Sally. Lightning was scared of failing. He didn’t want to come in second place. Sally gave him a reality check. There’s worth things than failure. Not taking the chance you have is worth than failing. It means you didn’t even give it a go. You’re going to be scared at some point in your leadership. You’re going to feel you don’t have the ability within you. You may not. But you won’t know unless you take the chance you’ve been given. Take the chance! Rusty and Dusty, the owners of Rust-Eze and the sponsor of Lightning McQueen, wanted to help Lightning McQueen to improve his race times. There was a problem. They didn’t have the resources or funds to get Lightning to the level he needed to be. These two leaders did something amazing. They chose to sell their business to someone who could help take Lightning McQueen to the next level. That’s a big step. One most leaders are unwilling to take. Yet great leaders are willing to do insane things to support their teams. They take their responsibility to care for their employees seriously. Think of one or two things you could do today to support your team. Rusty and Dusty told Lightning how much he meant to them. They also shared Lightning helped to create memories they will never forget. They got to take part in something great. And they’ll have that knowledge for the rest of their lives. That’s something great leaders do. They find ways to create memories their teams will take with them later on in life. What are you doing to help your team create memories they’ll look back on fondly? Find something today to help create a lasting memory. Cars 3 introduced the new character Cruz Ramirez, voiced by Cristela Alonzo. She’s a trainer at the new Rust-Eze training facility. As a trainer, she has a duty to uncover the fears of the cars she’s training. When a fear is revealed, she challenges the doubt. Then encourages the car to push through the doubt. You have the same opportunity as Cruz. You can help people challenge, and more importantly, push through their doubts. Great leaders acknowledge people have doubts. They also know most doubts can be overcome with hard work. Help your team challenge and overcome their doubts. Lightning McQueen was doubting himself. He had lost multiple races and he was feeling like his time may have come. Imagine how that must have made Lightning McQueen feel. He had doubts but wanted to do more. Her comments made him feel like he was old and unneeded. Your words matter. They’re going to impact your team one way or another. Make sure you’re speaking life to your team. There was a beautiful new racing simulator in the training facility. Lightning was longing to try his hand at the simulator. So much so, he felt like he knew how to use the simulator without training. What he found out was that he had a lot left to learn. Because of his arrogance, he destroyed a very expensive piece of equipment. When you begin to feel like you know everything there is to know, be careful. You’re beginning to tread into the arena of bad leadership. Great leaders know they still have a lot left to learn. Keep your mind open to new things. Too many leaders feel there’s a need for profanity in leadership. There isn’t. You don’t need to curse to make your point. Use clean language to get your point across and you’ll gain more respect than dropping the F-bomb. Cruz thought Lightning McQueen was nuts when he told her to turn right to go left. It doesn’t make any sense. Yet the strategy Lightning gave Cruz works. There will be times when leadership wisdom doesn’t make sense. You’re going to question whether or not it works. Sometimes you have to trust in age-old techniques. Cruz was training Lightning when he blew up at her. He told her she wasn’t a racer and she wasn’t helping. His words crushed Cruz. Why? Because Cruz looked up to Lightning. His exploits lit of desire within her to become a racer. You’re not going to know who looks up to you. Still, there’s going to be a lot of people looking up to you and admiring your leadership skills. Be aware of this as you’re talking to people. You may be talking to a huge fan of yours. I just never thought I couldn’t. When asked how he became a great racer, Lightning responded with the above Cars 3 quote. He never believed he couldn’t do what he set out to do. This impacted me deeply. There’s lots of things I think I can’t do. How would my life change if I began to never think I couldn’t do something? My life would change drastically. Yours would too. When you begin to believe you can, you begin to do. Begin to believe in yourself and your abilities. Lightning McQueen made a call to his good friend Mater back in Radiator Springs. Mater filled him in on the happenings around the town. He also shared everyone missed him dearly. When great leaders are gone, they’re missed. Their teams feel the impact in their absence. There are going to be things you love doing. You’re going to think there’s no way you could enjoy something more. Then you discover your ability to help others. This ability to help and guide others to a place of success places a new sense of good pride in your life. You’re able to discover the joy that comes from helping people. Be willing to step up and help coach other leaders. The joy you gain will be tremendous. Lesson 1: You’re old. You’ll never be faster than Storm. You can outsmart him. Sometimes as we age, we feel like we can’t keep up with the new crop of leaders. That’s the truth. You most likely can’t. What you can do is work smarter. You can do things the right way and get them done better. Don’t fret about your age. You’ve got wisdom behind you. Do you know what drafting is? In racing, you get behind another vehicle and use their slipstream to reduce the drag on your vehicle. Lightning McQueen had never used this technique before. He never needed to. With the intro of Jackson Storm and the new breed of racers, Lightning needed to look at new racing techniques. Drafting was one of those for him. As a leader, you can never stop learning. There’s great timeless truths. There’s also new insights being revealed every day. Lightning McQueen was racing Cruz. He thought he’d had her beat when she blew past him. His elation went to depression. His game was thrown off. The loss he experienced wasn’t due to a lack of skills. His loss was due to him losing the mental game. A lot of leadership is a mental game. You’re constantly moving pieces around and receiving feedback from your actions. When bad news comes your way, don’t let the news throw you off your game. Realize you made a mistake and push forward. Just focus on what you’re here to do. You’re going to have lots of different objectives coming your way. Some of these objectives are outside of the scope of what you’re there to do. You need to focus on what you’re there to do. Find someone else to do the other things. We discover late in the movie Cruz didn’t want to be a race car trainer. She wanted to be a race car. She had a chance when she was younger. When the chance came, she backed out. For years she’d lived with the regret of not taking the steps to become a real racer. What shots aren’t you taking? Why? Stop letting fear hold you back. Take some shots today. I started this race. You’re going to finish it. All of Lightning’s training led up to a big race against Jackson Storm. He was doing well but knew he wasn’t going to be able to finish the race like he wanted. He also knew there was someone who could. Lightning called an audible and pulled Cruz into the race. He had Ramone do a quick paint job on Cruz and got her into the race. Great leaders know they may start a race they may never finish. This means you may cast a vision and start the journey towards its fulfillment. You may never see the end results. Get the ball rolling. Then move aside when it’s time. While Cruz had an opportunity to race once before, she passed on the opportunity. Lightning helped rectify her bad call by sending her out on the track. She gave Cruz her first official chance to shine. Are you looking for people on your team to give first chances to? There are people all around you dying for a chance to prove themselves. Give them their first chance. Once Cruz entered the race, she quickly moved up the leaderboard. She passed other racers. It can be disheartening but the same happens in leadership. New leaders may move up more rapidly than seasoned leaders. That’s okay. Fresh leaders help an organization stay relevant and vibrant. Celebrate those movements. I’d already mentioned Cruz moved up rapidly. She eventually broke into the top 10 racers. When she did, Jackson Storm dropped back. He did this so he could trash talk her. He wanted to mess with her mental game. His plan worked. He threw her off of her game. But why did Jackstorm Storm attack Cruz? Because he was scared. He saw her as a threat. If you’re attacked by a senior leader, know it may not be your fault. He may see you as a threat and he’s scared. Try to allay his fears. Tell him you’re not there to replace him but to help. Lightning McQueen knew he still had a lot of racing left in him. But he also knew he had the ability to influence a future generation of racers. So he began to transition into a coaching role with Cruz. He helped guide her through the race. He shared his racing insights with her. And he helped her win the race. Great leaders know they won’t always hold the same position. They will transition at some point. Know you have options when the time comes. You can do so much! After Cruz won the race against Jackson Storm, the new owner of Rust-Eze tried to get her to race for him. She refused. She couldn’t race for someone who went against her principles. This raises a great question: Are you willing to work for an organization that goes against your principles or beliefs? Is that okay? I believe you need to stand up for what you believe. You can’t be wishy-washy on your principles. Question: Have you seen Cars 3 yet? If so, share a leadership lesson from Cars 3 you discovered. If you haven’t seen Cars 3, share a leadership lesson from Cars 3 that I shared that you enjoyed. 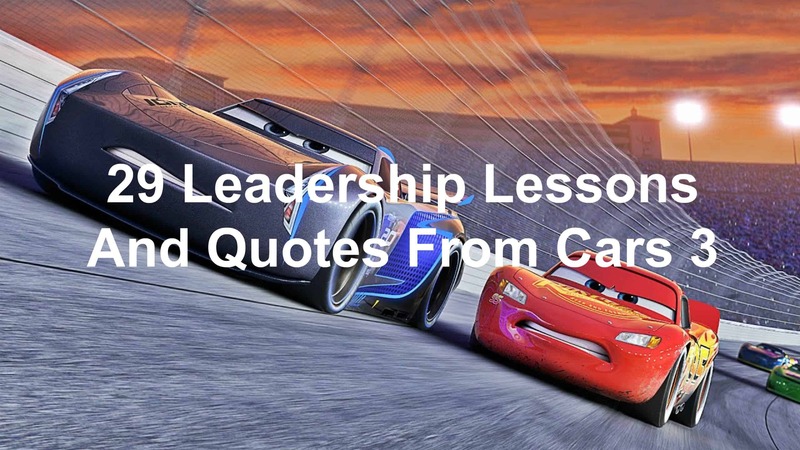 Let me know in the comments below what your favorite leadership lesson from Cars 3 was!